JV-KG (JVS, JVM, JVA) Positive Displacement Meter is ideal for measuring oil, fuel, polyurethane, brake fluid, Skydrol® and other non-abrasive, low- to mid-viscosity lubricating fluids. The JV-KG Positive Displacement Spur Gear Flow Meter is ideal for measuring oil, fuel, polyurethane, brake fluid, Skydrol® and other non-abrasive, low- to mid-viscosity lubricating fluids. 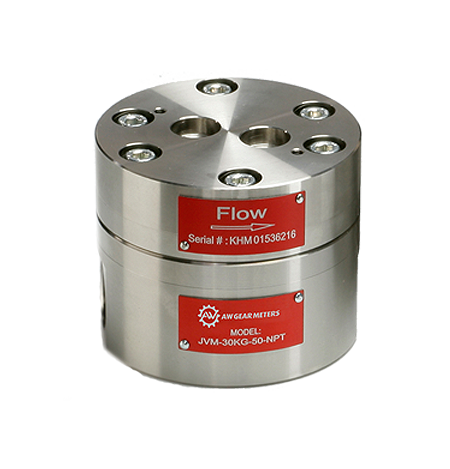 This positive displacement flow meter is available in six flow ranges (from .003 to 120 GPM / 4.32 to 172,800 GPD). This meter maintains accuracy of +0.5% of reading, despite changing viscosity conditions. Its rugged construction is also offered in aluminum, 303 and 316 stainless steel bodies for long-term reliability and investment. The units in this line of AW flow meters are designed to maintain consistent accuracy – even in changing viscosity conditions. They have a solid construction and excellent dynamic response. Reliability combined with accuracy and a large turndown range, make these meters an attractive replacement for older turbine technology. Simple to Install and Use: These meters are easy to use and install, since there is no need for straight run piping upstream or downstream of the flow meter. Accurate and Reliable: This meter has the ability to maintain consistent accuracy despite changing viscosity conditions* with accuracy of +0.5% of reading. Rugged Construction: The JV-KG’s solid construction is offered in Aluminum, 303 and 316 stainless steel bodies. Flexible Meter may be used in applications requiring bidirectional flow, and is offered in six different flow ranges (0.003 to 120.0 GPM). Economic Low Flow Meter: The meters produce good resolution and high accuracy at low flow rates, offering an affordable replacement for older turbine technology.